Earth Day is April 22nd, 2019 and is a day for us all to spend a little time learning more about our home planet and the many things we can all do to help protect. This celebration of our world began in 1970 in the U.S. as a day when teachers at all levels of education would teach their classes about our environment. Senator Gaylord Nelson is credited with its creation. Today, Earth Day activities carry on for more than just one day; in many areas around the globe, these celebrations last for a week, if not the whole month. Planning an Earth Day Celebration? Each year in New York City the Peace Bell is rung as part of the nation's Earth Day activities. The Peace Bell was a gift from Japan and is rung at the precise moment when the Vernal Equinox occurs. While you might not have a Peace Bell in your back yard or school sports field, this doesn't mean you can't still celebrate with your guests or kids. At Wedding Sparklers Outlet, we carry a selection of eco-friendly confetti cannons that make the perfect addition to your planned event. Our eco-friendly confetti cannons are filled with multicolored biodegradable paper confetti. So many confetti cannons use mylar or plastic confetti because it is shiny and inexpensive. The problem with using these materials is that they last virtually forever. No matter how hard you work to clean it up after the event, there is still some that will end up as part of the problem rather than the solution. As you are planning your Earth Day celebrations, everything you plan needs to be part of the solution to protect our planet rather than adding to the problem. Doing things right should include education on what everyone can do to help take care of the only world we have. This would mean not using anything in your activities that will create more pollution. This is a good reason to use our eco-friendly confetti cannons. They come pre-loaded with loads of multi-colored biodegradable paper confetti. A simple twist of the tube and "BOOM!" a shower of confetti will blast up to 20 in the air, showering everyone in thousands of pieces of colored paper. As the Vernal Equinox approaches, you can have the live coverage from New York City on the TV or if you are outside a laptop or smartphone. Gather your guests or students together and hand each of them one of the confetti cannons. At the exact moment of the Equinox, have everyone fire off their cannons creating a massive cloud of multi-colored paper confetti. Kids of all ages from (eight to eighty as the saying goes) will absolutely love it and what a great way to celebrate this important date. The best part is that once your Earth Day activities are over, cleanup is a breeze. You can sweep up the bulk of the confetti and leave the rest alone. The first rainstorm or a garden hose will dissolve the biodegradable paper and wash it harmlessly into the ground. 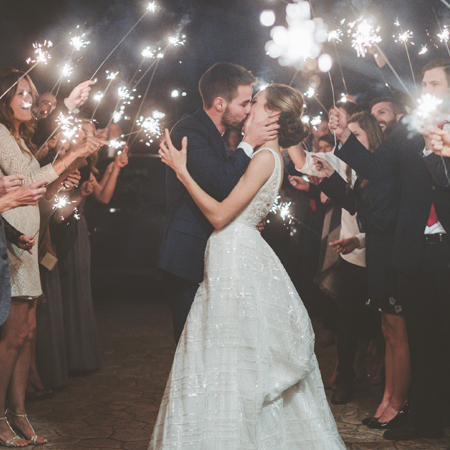 Visit Wedding Sparklers Outlet online and take a look at our eco-friendly confetti cannons.